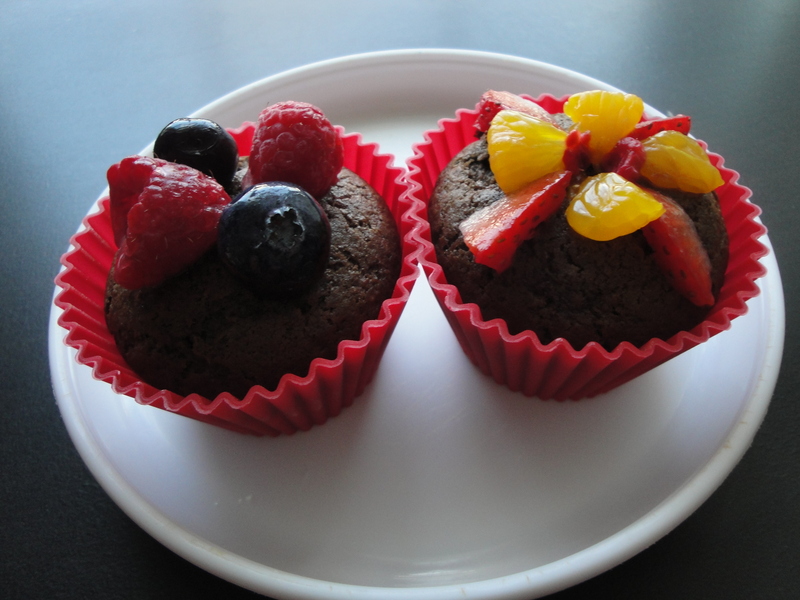 A few years ago, when my eldest daughter’s birthday came up, I thought it was a great opportunity to make some dairy- and egg-free birthday cupcakes. Not that my daughter had an allergy to cow’s milk or egg, but my past experience in pediatric food allergy research has granted me a heart for families with children that have multiple food allergies and need simple easy but great tasting recipes. Plus the dietitian in me just can’t resist trying out a new recipe when I get the chance! So here’s a recipe below that is so simple and easy, you don’t need to use a mixer. Make it chocolate flavored or not. The family loved it and I hope you do too! A super easy recipe that’s not too sweet. Make these for an upcoming birthday or make them for fun with your child as a kitchen helper! Combine dry ingredients and mix thoroughly in a bowl, then set aside. Mix wet ingredients in a separate bowl (use a 1/4 cup of water or fortified plant-based milk first) and then stir to combine together. Add wet ingredients to dry ingredients and mix until a smooth batter is obtained. Add a bit more water (one tablespoon at a time) if the batter is too thick, until the desired consistency is reached. Pour batter into 12 cupcake molds or into a lightly greased and floured cake pan (8.5 inches in diameter). Bake in the oven for about 35 minutes for a cake or 20 minutes for cupcakes, or slightly longer until done (this is when a toothpick or knife inserted in the cake comes out clean). Cool before applying frosting if desired. If you use maple syrup or agave nectar instead of the brown sugar, then mix up the batter without adding any water first. Depending on the thickness of the batter, slowly add in tablespoons of water and mix until the desired baking batter consistency is reached. For a gluten-free option, you can try to use 1 ¾ cup of gluten free flour mix instead of the wheat flour and include 1 teaspoon of xanthan gum in the recipe. For those who simply want a vanilla cake, just omit the cocoa powder and double the amount of vanilla extract used in the recipe. You will need to reduce the amount of water (or fortified plant-based milk) added to achieve the same cake batter consistency.